In the previous post we saw how to build a simple Web API from scratch using a couple of OWIN/Katana components. We added a couple of Katana libraries from NuGet, wired up the routing from the Startup class and we were good to go. In this post we’ll see one way to make the application run independently of IIS. As we stated before an important benefit of this new OWIN infrastructure is that you can make your ASP.NET web application run on multiple hosts, not only IIS. IIS is only one of the options. 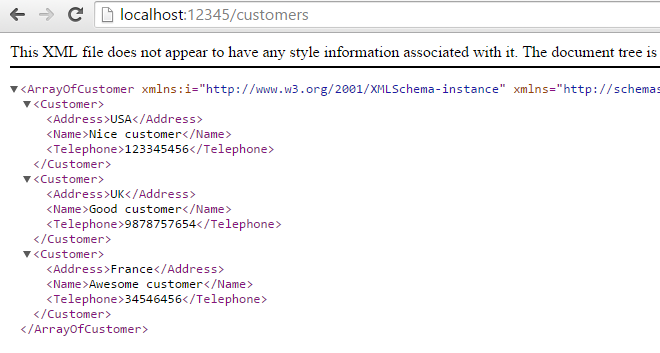 If you want to host your Web API app on IIS then you don’t need to do anything special as it is the default. System.Web is part of the reference list and the application is set to run on IIS. It’s easy to change this set up. We started a Web API 2 app called CustomersApi in the previous post. We’ll build this post on that same app. You can test to remove the System.Web dependency from the project and run the application on OwinHost. It should work like before. The application will continue to work even on IIS in its present state as we don’t use any IIS specific features such as authentication. However, any non-trivial application will still need System.Web if hosted on IIS. We’ll look at another hosting option in the next post. I am looking for a c++ sdk,, casablanca client communicating with OWIN katana c# server. Canyou guide me ? Sorry, I can’t help you here. I don’t work with C++ so my knowledge there is near 0. Well, OwinHost doesn’t appear as an option for a server under project properties. Yeah, I followed it step by step. So, I tried a new project from scratch and the same lack of a drop down entry occurred. In the end I worked through the install.ps1 script contained in the OwinHost package and manually ran the following command and I then got the warning about pre VS2013 not supported, pressed OK and now I see OwinHost in the drop down. I’m running Visual Studio Ultimate 2013 Version 12.0.31101.00 Update 4 so I reckon the first return is skipped. Can you think of any reason why this wouldn’t be a WAP project? That result doesn’t equal null so I figure the subsequent steps would be executed. Anyway, I can get there by hand so not all is lost. Would be nice if the packaged script worked though.